View from above the Center Street intersection, facing north. On the right: Milton Trust & Safe Deposit Co.; Dreifuss Brothers Clothier; Knauer’s Shoe Store; the Lewisson block; Schreyer’s Deptartment Store; the Hotel Haag (later The Milton). 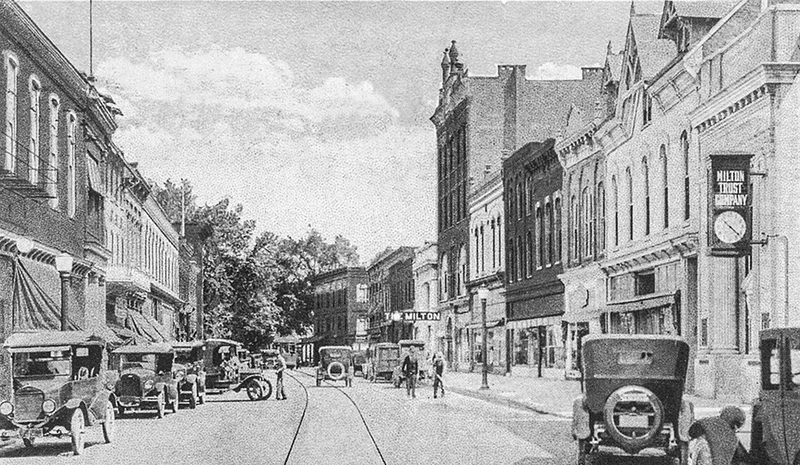 On the left: Milton Opera House; First National Bank; William H. Harris restaurant; Gauger’s Merchant Tailor; John Y. Buoy Upper Block.